Legendary musician Roy Orbison is gone but definitely not forgotten. The legendary musician will posthumously receive an award from the Musicians Hall of Fame and Museum. Orbison will be awarded the Iconic Riff Award. The award, which is being awarded for the first time, is being awarded to Orbison for his hit 1964 song, ‘Oh, Pretty Woman.’ The song would go on to become a number one single after its original release. Heads of the Musicians Hall of Fame and Museum said the reason that Orbison was chosen as the first recipient of the award because of the riff that opens ‘Oh, Pretty Woman.’ The song itself has been covered by countless artists. It rose to its biggest fame thanks to rock band Van Halen’s cover of the song. It was also the inspiration for the hit 1990 rom-com, Pretty Woman, starring Richard Gere and Julia Roberts. The song itself can even be heard in the movie’s soundtrack. Along with its numerous covers and use in movies, ‘Oh, Pretty Woman’ the song is also included a new live concert recording from Legacy Recordings titled Black & White Night. The DVD recording was released this week. It was recorded in September of 1987 and includes the likes of: Bruce Springsteen, Elvis Costello, Jackson Brown, JD Souther, and Tom Waits joining the star for his hit song. Roy Orbison is one of the music industry’s most well-known and respected names. He started his career in 1956. He was signed to the famed Sun Records at the time. The label also boasted the likes of Elvis Presley, Jerry Lee Lewis, and Johnny Cash on its roster. It wouldn’t be until he signed a deal and recorded for Monument Records in the early to mid-1960s that his career truly took off. The release of ‘Oh, Pretty Woman’ marked the peak of his career at the time. 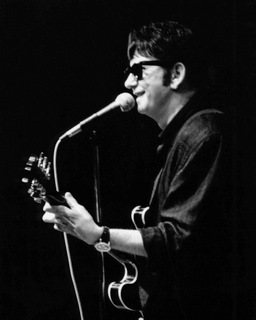 The song, which Orbison co-wrote with Bill Dees, would go on to sell seven million copies and spend three weeks at number one on the Billboard Hot 100 Chart. It also peaked at number one on the British charts for three weeks. This was an unprecedented feat for any American recording artist at the time. That is because The Beatles were dominating both countries’ charts at the time. A new collection of Orbison’s hits titled The Monument Boxset will be released November 26th. The collection is a vinyl only package that includes three of the most well-known and beloved albums that Orbison recorded during his time with Monument Records. Those records are: Lonely and Blue, Crying, and In Dreams, which was also just recently re-issued on CD. The new box set also includes a fourth album that had not existed until now. The album will be centered on ‘Oh, Pretty Woman’ and will be comprised of five tracks. The album’s songs were chosen by Orbison’s own sons, Alex, Roy Kelton, and Wesley Orbison. Orbison’s suns have maintained their father’s legacy, running Roy’s Boys LLC, which is responsible for managing their father’s likeness, image, and musical releases. Roy’s Boys LLC and Legacy Recordings are set to release one more live Roy Orbison concert before the year ends. The Last Concert – 25th Anniversary Edition chronicles what would be Orbison’s final concert before his death in 1988. The concert was recorded on December 4th, 1988. That was only two days before he would suffer a fatal heart attack. The fact that he would pass away only two days later is only part of what makes the upcoming concert so important. Orbison commonly closed his shows with a performance of ‘Running Scared.’ But recording engineers ran out of tape that night before Orbison performed the song. The result of that shortage is that ‘Oh, Pretty Woman’ would end up being the final number from his final ever concert. More information on all upcoming Roy Orbison releases is available online at http://www.royorbison.com and http://www.facebook.com/royorbison. To keep up with the latest sports and entertainment news and reviews, go online to http://www.facebook.com/philspicks and “Like” it. Fans can always keep up with the latest sports and entertainment news and reviews in the Phil’s Picks blog at https://philspicks.wordpress.com.